Spike Lee's true story of a black police officer infiltrating the Ku Klux Klan in the 1970's, starring John David Washington, Adam Driver, Laura Harrier, and Topher Grace, is a powerful cinematic Molotov cocktail that hearkens back to Lee's classic films. The premise of BlacKkKlansman, Spike Lee’s impassioned, incendiary, often brilliant new film, sounds like a joke. In 1978, Ron Stallworth (John David Washington, son of Denzel), a black rookie detective in the Colorado Springs police department, infiltrates the local chapter of the Ku Klux Klan by impersonating a white racist over the phone. Spike Lee’s filmmaking career has stretched well past three decades, and while his films have encompassed many different modes and moods, he’s best known for the passionate, provocative, and artful agitprop that informed such classic works as Do the Right Thing, Malcolm X, Jungle Fever, and Bamboozled. Lee has consistently created innovative, thought-provoking, and often confrontational and controversial works, but it seems that in recent years relatively few people have been paying attention. BlacKkKlansman, however, should successfully bring Spike Lee back to the place where he connects with a mass audience with work fully plugged into the current zeitgeist. And he couldn’t have picked a better subject matter with which to do so. The film’s release coincides with the one-year anniversary of the white nationalist rallies in Charlottesville, Virginia, and the accompanying violence which took the life of anti-racist activist Heather Heyer, the real-life footage of which forms a chilling coda to the dramatized period story. Lee throughout the film hammers home the blunt and very unsubtle point that even though he’s made a period piece, as far as the unshakable persistence of virulent white racism against people of color, that period is far from over. In Spike Lee’s cinematic Molotov cocktail, there is little room for subtlety or nuance; in fact, he seems to argue that unsubtle times call for unsubtle art. Lee aims directly at his targets, making sure we in the audience are aware at all time who those targets are and why they deserve to be targeted. Even though his main target is the brand of white nationalism and racist sentiment and actions represented by the KKK, as well as a nation that countenances them and allows them to freely operate, Lee has a few others in his sights as well. One of those targets is cinema itself, specifically two films in particular, blockbusters of their time, still regarded today by many as classics. The first is Gone With the Wind; BlacKkKlansman opens with the famous crane shot of wounded Civil War soldiers writhing on the battlefield with Vivien Leigh’s Scarlett O’Hara wandering amongst them, a shot which culminates with a tattered yet proudly waving Confederate flag in close-up. This leads into a brief opening scene featuring Alec Baldwin in a cameo as an unabashed bigot spewing hatred into the camera, his face bathed in lurid colors, fulminating against the miscegenation and integration he abhors, which he believes is turning America into a “mongrel nation.” As Lee will do frequently in the film, he exposes the ridiculousness of this racist rhetoric, in this scene by having Baldwin’s character constantly stumble over his words and interrupt his own speech to confer with an off-screen consultant. This scene confronts us with the racist ideology that later we will see KKK Grand Wizard David Duke (Topher Grace) attempt to sugarcoat with three-piece suits (in place of hoods), a cleaned-up vocabulary, and a more palatable image. The other piece of film criticism Lee practices within his own film is directed against D.W. Griffith’s Birth of a Nation; while its racist imagery is generally abhorred nowadays, it’s often still regarded as a formative film history text for the cinematic techniques Griffith demonstrated. (President Woodrow Wilson famously praised it as “like writing history with lightning.”) In BlacKkKlansman, it figures in a scene where a visiting David Duke and the Colorado Springs KKK members holler at and cheer on a screening of Griffith’s film. In Birth of a Nation, lynching and other forms of violence against black people is celebrated. Here, Lee re-contextualizes this in a powerful manner, juxtaposing this in a scene in which a civil rights activist portrayed by Harry Belafonte relates the story of the lynching of a man named Jesse Washington which occurred around the time of Birth of a Nation’s release. Belafonte’s character speaks in front of the rapt members of the Colorado Springs Black Student Union, and the story he tells is illustrated by graphic archival photos of the lynching, demonstrating the real-life horrors that Griffith’s film justifies and romanticizes. However, BlacKkKlansman is far from a dreary, depressing lament of America’s racism. Lee cannily uses lots of comic sugar to make the medicine of his message go down. Much of this humor is at the expense of David Duke and the KKK, who are exposed as ignorant and easily fooled as they are ultimately dangerous. The KKK are easily fooled by Ron and Flip’s subterfuge, even though they sound nothing alike, and the scene in which Ron finally lets Duke know he’s been fooled by a black man, and a black police officer at that, is priceless. Lee also beautifully counteracts the ugly white racism depicted in his film with luxuriant images of black beauty, a testament to the great work here by cinematographer Chayse Irvin, who shot these rich images on 35mm film. The scene in which this black beauty is most prominent is during a speech Kwame Ture aka Stokely Carmichael (Corey Hawkins) gives to the Black Student Union (which Stallworth monitors for subversive activity as his first assignment). As Ture speaks, the screen is filled with many close-ups of the black men and women listening in rapt attention, inspired by his words. The beauty, dignity, and grace inscribed on those faces makes for one of the film’s loveliest and most moving scenes. 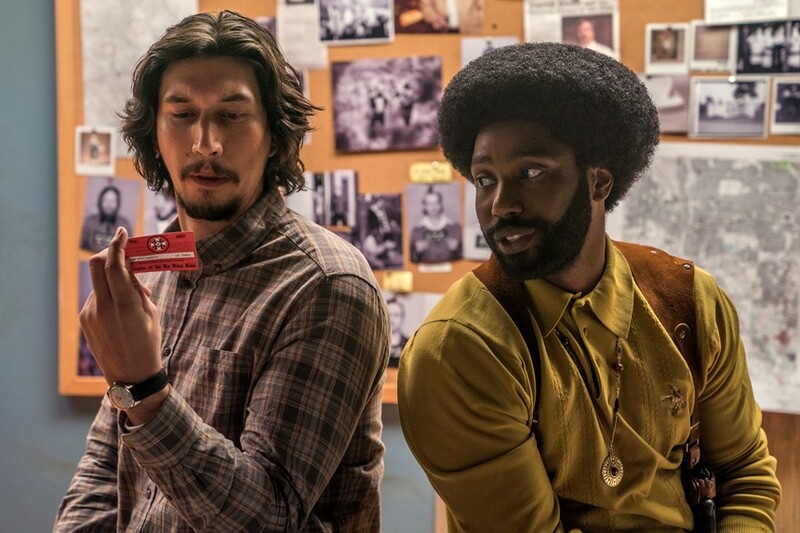 As powerful and brilliant as BlacKkKlansman mostly is, it’s not without flaws. There’s not much interiority to the characters; as well acted as they are by those portraying them, these characterizations mostly play on the surface level, often as representatives of their political positions. There are certain motivational details that remain a mystery, for example why Stallworth, knowing how racist the police can be, still wants to remain a police officer. For him to simply say, “I’ve always wanted to be a cop,” seems insufficient here. Also, while the KKK looms as the film’s most obvious target, it mostly lets the police – who in the film only see fit to hire one black cop in all of Colorado Springs – off the hook, notwithstanding the words spoken in the film about cops shooting black people without justification. There’s one obviously racist cop in the film who eventually gets his comeuppance, but we don’t get much of a sense of how racism structurally works in the department. BlacKkKlansman opens in theaters on August 10.